Host: Many fruits, vegetables and ornamentals are susceptible. Annual vinca (Catharanthus roseus) and Vinca minor, are very susceptible to this disease. Root rot is involved in some, but not all cases. Symptoms: (See photo 1 below.) 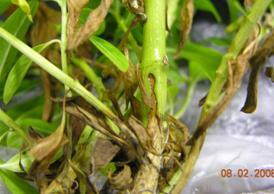 Black to brown lesions form on stems, causing the portions above to die back. Pathogen cycle: Phytophthora is referred to as a fungal-like organism, but it was reclassified under the Kingdom of Stramenopila recently. Phytophthora species are often called water molds because two of their spore types develop under wet conditions. Thus, these pathogens are often found in wet or poorly drained sites. Over-watering plants in moderate to dry sites also favors these organisms. With aerial blight, frequent irrigation or rainfall makes conditions conducive by allowing foliage to stay wet and keeping humidity high. 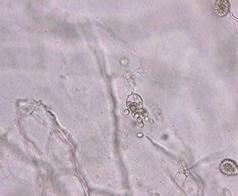 Under these conditions Phytophthora develops sporangia that produce many swimming zoospores (See zoospores in photo 2.). These zoospores move in water films or are splashed to healthy tissue. Management: Water management is the main preventative measure. Frequent watering, even in moderate to dry sites, can make conditions conducive to branch blight and root rot. Annual vinca and Vinca species are drought tolerant, so water only as frequently as is needed. When rainfall is insufficient to supply an inch of water per week, apply deep supplemental irrigation once, or possibly twice per week, depending on soil type and weather conditions. Avoid excessive amounts of fertilizer as well. To help prevent root rot, it is also important to provide excellent drainage. When preparing a plant bed, thoroughly dig up the whole area. Adding organic materials, such as composted pine bark, to the soil will help increase drainage due to improved soil structure. Materials with a high water holding capacity, such as peat moss, are not recommended, especially in clay soils. Annual vinca is one of the few annuals that is susceptible to aerial blight. There are some plants that are resistant to Phytophthora root rot, including French marigolds and zinnias. Impatiens and begonia are only slightly susceptible. In addition to annual vinca, salvia and snapdragon have been found to be highly susceptible to Phytophthora root rot. Fungicides can be applied on a preventative basis, but due to the expense and environmental considerations, these should not be the sole means of control. When plants do become infected, discard the infected plants and make a preventative fungicide application to all plants in the general area. Products containing Fosetyl-Al and Phosphorous Acid can be used by home growers to manage diseases caused by Phytophthora species.